Now the majority of this post is going to be for my benefit, as I'm going to be reporting the results of the survey. If you just want to see who won, go ahead and scroll down to the bottom. But if you're interested, feel free to check out my charts! 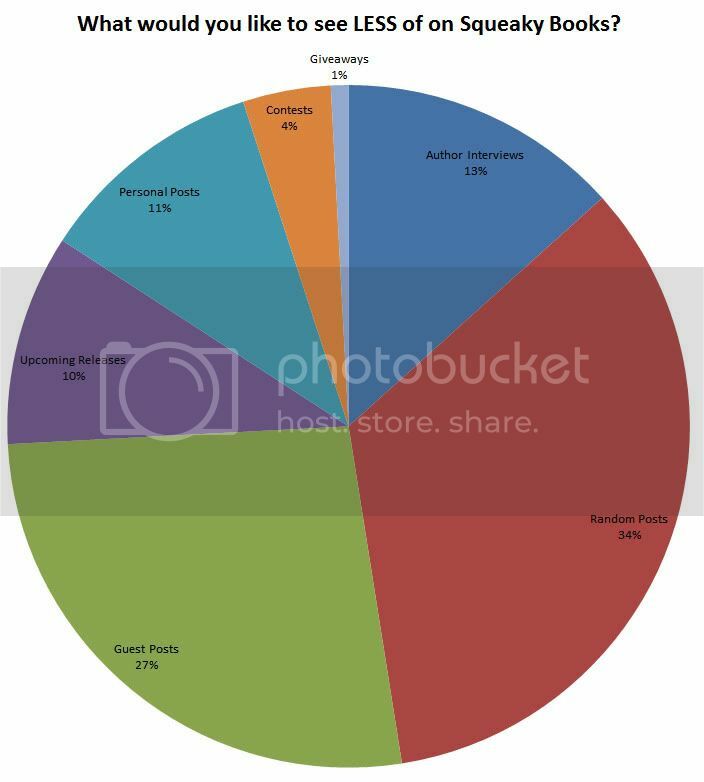 It's no surprise to see that the majority of my readers are book bloggers followed closely by readers. In all reality, book bloggers ARE readers, so that's good. That means I'm reaching the audience I want to! 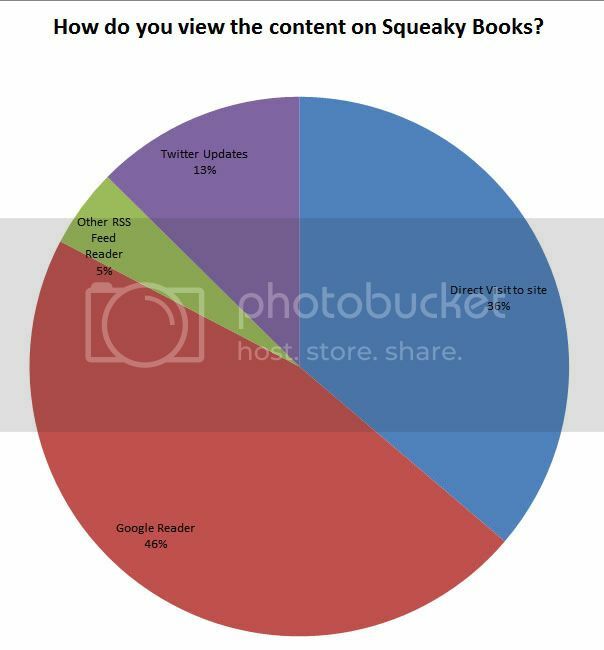 How Often Do you visit Squeaky Books? How do you view Squeaky Books? Most of you view using Google Reader, which means that this post is probably gonna look weird to you. Also lets me know that my layout is significantly less important than my content (well, duh). However, there is still a LARGE portion of you who visit directly to the site, so I'm still kicking around that idea of a new layout. 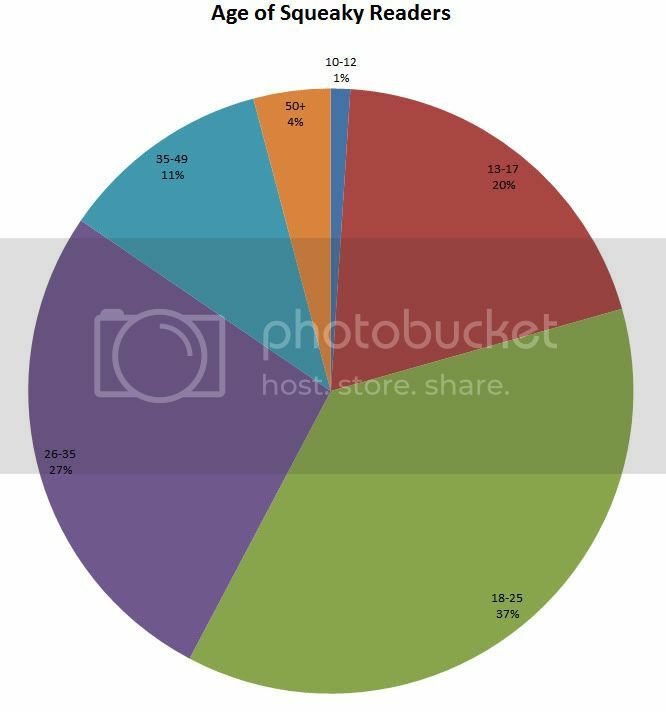 How interesting that well over 50% of my readers are 18-35. I read for young adults, which I've always equated with teens, and yet the majority of my readers are NOT teens. I'm cool with that, though. Since I fall into that 18-35 category and yet I prefer YA. If you guys are reading, I don't really care WHAT age you are! And I know that my parents wouldn't have been too thrilled with me going on the Internet to blog-hop when I was 13-ish. Not surprising in any way shape or form. How do you attain your books? 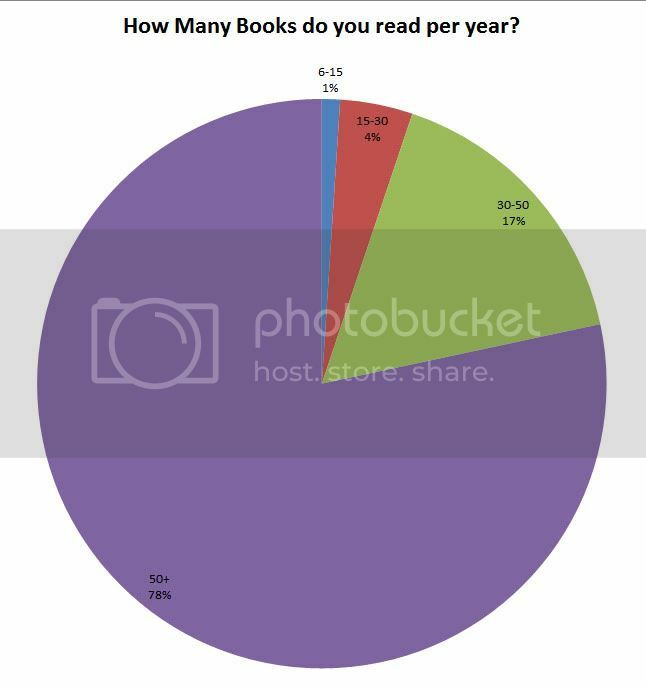 Again, not entirely surprising that the majority of you get your books from the library. It's cheapest. 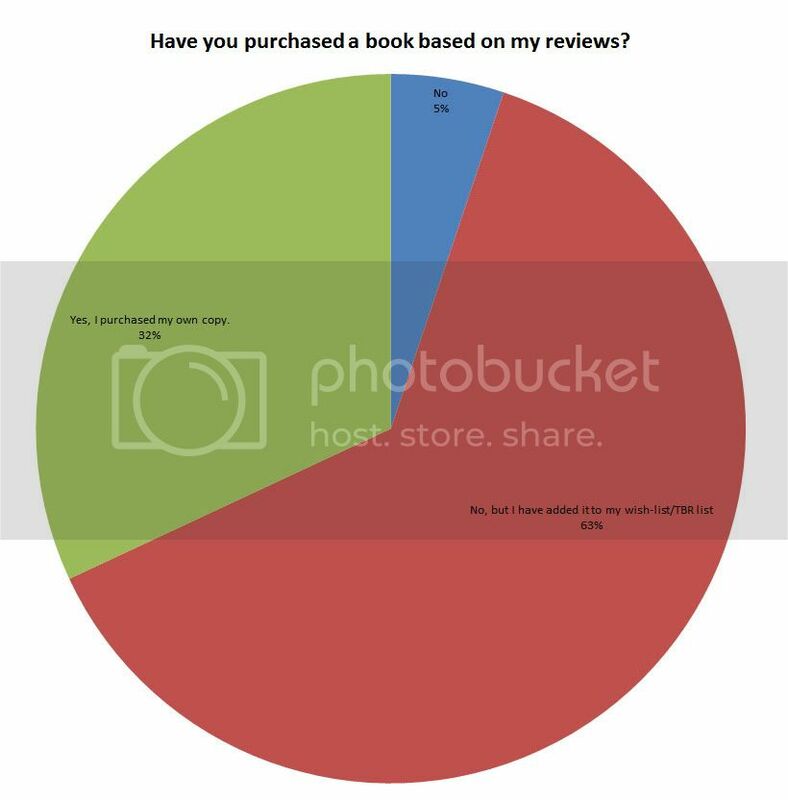 However, I expected that more people would buy their books online than they would in a store. I know I do. I only go to a store if I have a gift card. Have you ever purchased a book based on one of my reviews? This made me very pleased. 32%? Yay! 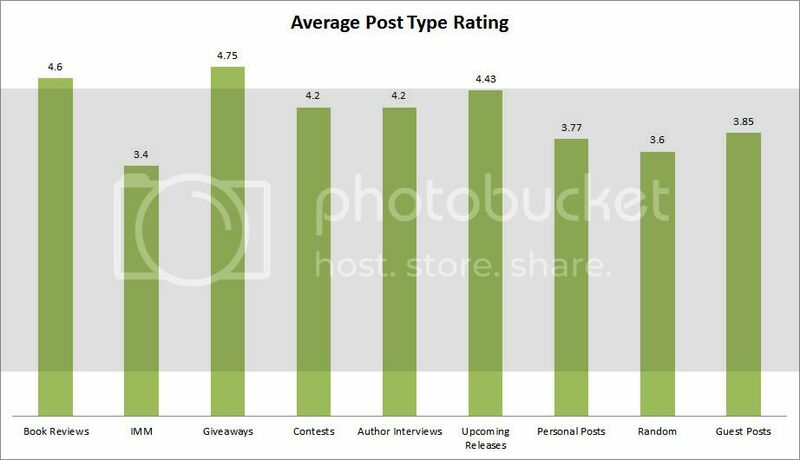 Too bad that my IMM posts have the lowest rating. Sorry if you don't like those, but I like to make them. So I ain't gonna stop. They're only once every couple weeks anyway. And 3.4 is not a very low rating. Glad to see y'all like my posts so much. 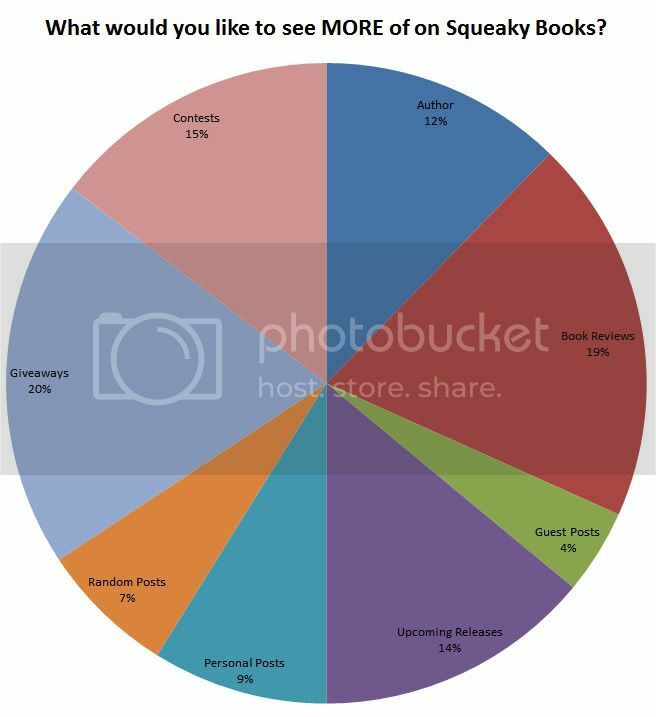 What do you want to see MORE of on Squeaky Books? The even distribution on this tells me that y'all would be happy with just MORE content, regardless of what it is. I'll focus on reviews and giveaways, though. 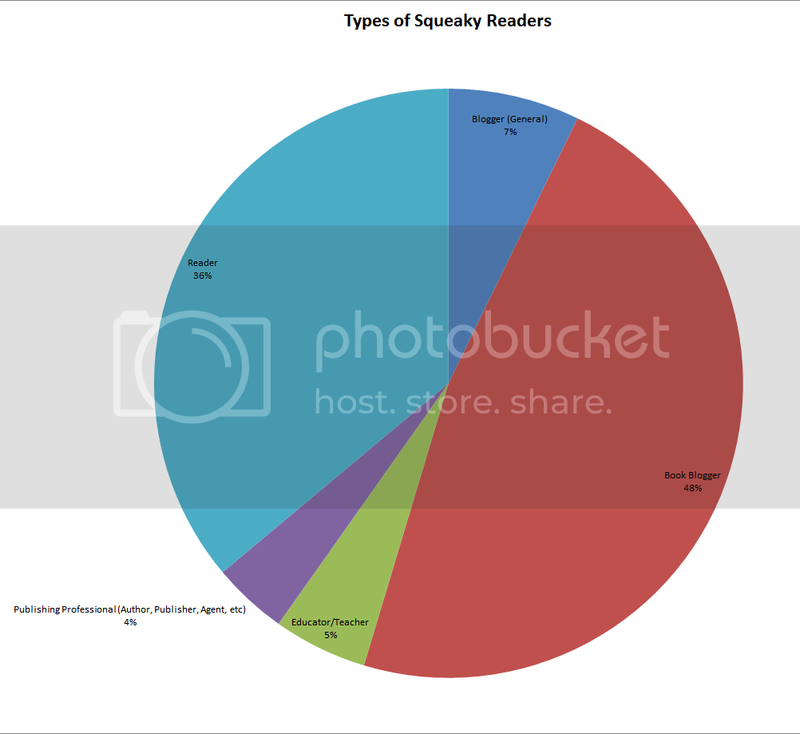 What do you want to see LESS of on Squeaky Books? Less random posts. Message received. One last chart for you. 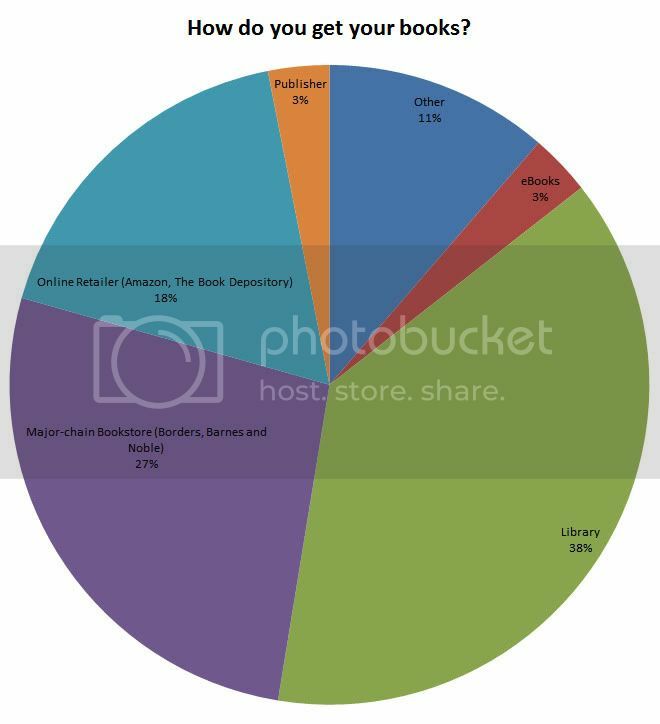 Here's the distribution of what books people would like to win. I'm not very surprised since there seems to be a correlation between when the book was released, and how many people want to win it. 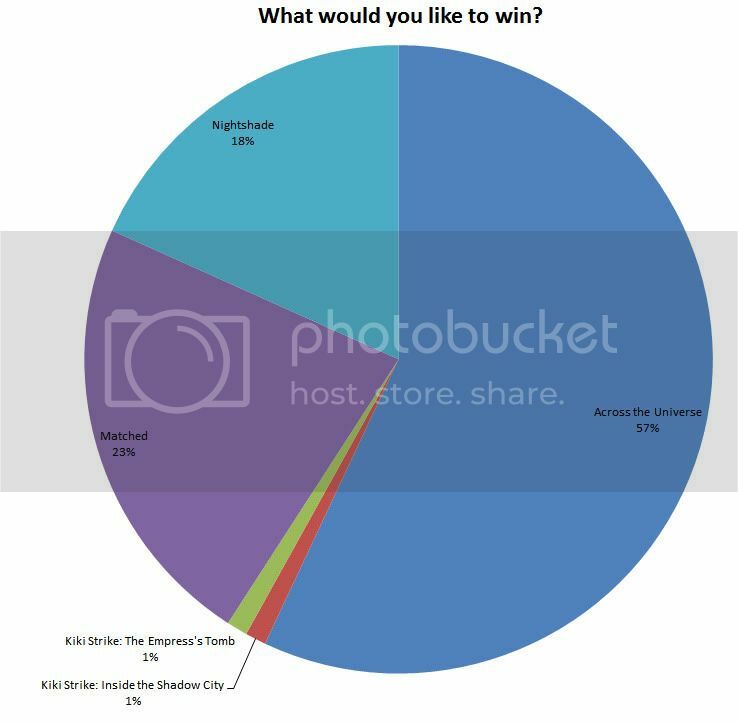 Which book would you like if you win? And she chose Across the Universe. Thanks so much to everyone who filled out the survey. It was really helpful. Is it going to drastically change the way things are done here? No. But I will keep it in mind. I recently read across the universe, and totally get why so many people voted for it!